President of Koraput District Congress Committee (DCC) and wife of firebrand Congress MLA from Jeypore, Taraprasad Bahinipati, Minakshi Bahinipati was injured in a road mishap on December 12. She was rushed to Vizag with multiple injuries. The incident occurred on the way between Koraput and Jeypore when she was travelling in a Bolero. Her vehicle hit a truck at Deoghati. 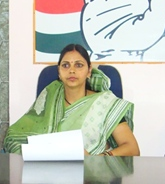 Minakshi Bahinipati suffered injuries on her head and chest. She was first treated at Koraput hospital, but later shifted to Vizag. Her condition is said to be stable.